The packaging is not child-resistant as required by the Poison Prevention Packaging Act. The supplement tablets inside the bottle contain iron, which can cause serious injury or death to young children if multiple tablets are ingested at once. No incidents or injuries have been reported. About 7,400 bottles have been recalled. 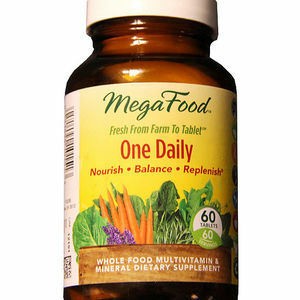 The recalled supplement bottles are brown glass bottles that contain MegaFood One Daily Tablets. The bottles have a yellow label on the front with the words "MegaFood," "Fresh From Farm To Tablet," "One Daily," "Nourish," "Balance" and "Replenish" printed above a picture of vegetables. Recalled bottles have the following amounts, product codes and lot numbers:\\\\n\\\\n1.\\\\nAmount: 60 tablets\\\\nProduct Code: 51494 10151\\\\nLot Numbers: 10613, 10724 through 10728, 11246 and 12191\\\\n\\\\n2.\\\\nAmount: 90 tablets\\\\nProduct Code: 51494 10152\\\\nLot Numbers: 10613, 10724 through 10728, 11246 and 12191\\\\n\\\\n3.\\\\nAmount: 180 tablets\\\\nProduct Code: 51494 10153\\\\nLot Numbers: 10613, 10724 through 10728, 11246 and 12191\\\\n\\\\nThe amount is on the bottom right of the front label. The product code and lot numbers are on the left side of the front label. Sprouts Farmers Market, Vitamin Cottage, Whole Foods Market and other natural food stores nationwide from June 2012 to October 2012 for between $39 and $90. Immediately place bottles of this product out of reach of children and return any recalled bottles to the original place of purchase for a full refund or replacement. Contact FoodState by calling 866-234-2668, emailing productintegrity@megafood.com, or visiting megafood.com and clicking "Read More" in the Safety Notice section of the page. FoodState d/b/a MegaFood, toll free at (866) 234-2668, from 9:30 a.m. to 6 p.m. ET Monday through Friday, or by e-mail at productintegrity@megafood.com; or online at http://www.megafood.com, then click on “Read More” in the Safety Notice section of the page.